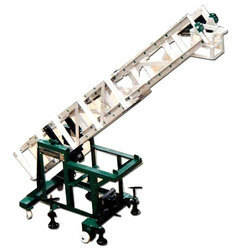 Our range of products include Aluminium Ladders such as Aluminum Step Trolley Ladder, Aluminium Folding Ladder, Aluminium Simple Ladder, Aluminum Self Supported Ladder, Aluminium Tower Ladder and Scaffolding Aluminum Tower Ladder. Diameter 2 5/8" x 1 1/4"
We are well known firm for manufacturing and supplying best quality Aluminum Step Trolley Ladder. 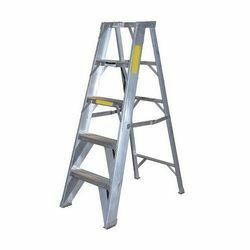 Due to its fabrication by using fine grade aluminum and advanced machines, these ladders are highly durable and superior finished. We serve varied demands of our customers more efficiently by providing these ladders in different specifications. Furthermore, we supply these ladders in tamper proof packaging at nominal price range. We use highly tensile aluminum alloy in the manufacture of HY - SEAT Aluminum Auto Folding Ladder. 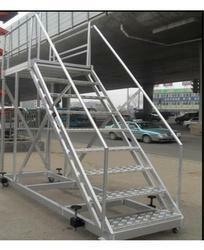 There is a platform fitted in the middle and it is a very safe and comfortable folding ladder for doing work overhead. This ladder is rust proof, fire proof, dust proof and light in weight. Leveraging on our wide prowess, we are offering wide variety of top notch quality Aluminum Simple Ladder. 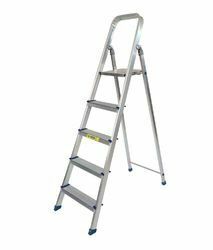 Our offered ladders are widely used for simple works in homes and shops, owing to their light weight yet high strength. We design these ladders in various sizes by utilizing premium quality aluminum and modern machines for their fabrication. 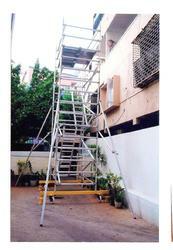 Furthermore, clients can avail these ladders according to their requirements at pocket friendly rates. 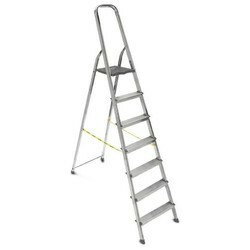 This Self-Supported Ladder has been made with very good quality aluminum. This has two and a half steps for landing. This is available with us in different sizes. We are the leading manufacturers and suppliers of the Aluminium Tower Ladder. Our clients can avail from us a wide range of Scaffolding Aluminum Tower Ladder that is designed to perfection by our expert professionals. Offered in various specifications, these are further quality tested on well-defined parameters before supplying it to our clients. Looking for Aluminium Ladders ? Shree Modi Material Handling Co.